Thank you for visiting the StoryMakers webpage. Rocky Mountain PBS will not be offering the StoryMakers Contest in 2018-2019, but hopes to transition this program to one of our community partners over the next year so it resumes again in 2019-2020. Congratulations to the 2017 StoryMakers’ Winners! For the past 10 years, Rocky Mountain PBS has celebrated young writers with the StoryMakers short story contest. This year, we are asking all 6th, 7th and 8th grade authors in Colorado to submit a short, fictional story that captures a Colorado “sense of place.” Whatever the story is that you imagine and want to tell, we want Colorado to be a primary presence. Colorado is a place, it’s a feeling, it’s a smell, it’s a picture….you can touch it, see it, taste it. Setting includes more than just environment. It includes any external details that reveal more about experiences, observations, characters (how they react and feel), etc. Setting can be an active force in a story; think of a farmer on the eastern plains terrified the drought will be so severe he’s not sure he can feed his family this year. Or think of a young boy who loses his way hiking and is led back by a spirit of the Ute tribe. Or think of a woman living far in the future who stumbles upon a strange cave high in the mountains in a place once called Colorado. In this way, setting can be a character in the story….a central element that shapes and drives the narrative, the characters, the conflicts and the resolutions. Entries are judged on the integration of the Colorado as a “sense of place,” originality, creative expression and storytelling. StoryMakers is in its eleventh year and each year we receive over 500 state-wide entries. Finalists (eight for each grade) will be named in December 2017/January 2018 and invited to an all-day workshop (and station tour) facilitated by an instructor from Lighthouse Writers Workshop and a journalist at the Rocky Mountain PBS station in Denver on Saturday, January 20, 2018. Awards Luncheon will be held in the Denver area on Saturday, February 24, 2018 and attended by all finalists and their families. Winners are announced and special prizes awarded. Winners’ stories are published on the Rocky Mountain PBS website. 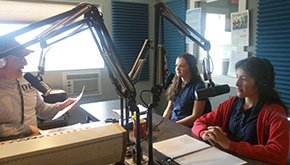 Listen to an interview with radio KAFM in Grand Junction with teacher and StoryMakers’ authors from Holy Family Catholic School.